Solved: Method not found: ‘! !0 System.Array.Empty()’. Chances are the server you are deploying to does not have the appropriate framework to support your app. Download the Microsoft .Net Framework 4.6.1 and install it to resolve this. It will likely require a server reboot to complete it so don’t do it on prod mid-day! Hope this helps, questions are welcome! 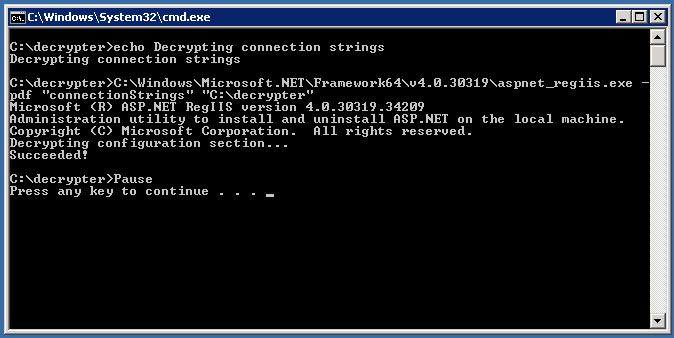 This page will attempt to describe how to encrypt sensitive information contained in .NET config files using the RSA Key Container, as well as how to export/import the key from that container so that other developers may use the same key to work on the same project. Helpful Tips: The aspnet_regiis.exe utility must be run as a administrator, otherwise you may receive “duplicate object” errors. In addition, you will want to run Visual Studio as an administrator to ensure the program has access to the RSA Key Container store. In this part we will create an RSA key container by using aspnet_regiis.exe with the -pc option. This identifies the RSA key container as a user-level key container. RSA key containers must be identified as either user-level (by using the -pku option) or machine-level (by not using the -pku option). For more information about machine-level and user-level RSA key containers, see Understanding Machine-Level and User-Level RSA Key Containers. The following example shows the configProtectedData section of a Web.config file. The section specifies an RsaProtectedConfigurationProvider that uses a machine-level RSA key container named SampleKeys. aspnet_regiis -pa "SampleKeys" "NT AUTHORITY\NETWORK SERVICE"
aspnet_regiis -pa "SampleKeys" "[impersonation account]"
It may be necessary to only encrypt part of a section in a web.config file. For example, if the appSettings section contains multiple, non-sensitive keys and only a subset contain sensitive information. To encrypt only a few keys, a second appSettings section must be created and the new keys moved into it. The keys are accessed exactly the same way in the code, so no coding changes are needed. This Microsoft utility was designed for web.config files. It will not find app.config files for other project types. To encrypt these config files, just rename them to web.config prior to encrypting, then rename back afterwards. If you have .Net web applications that are connecting to data sources that you do not want other users to know about then chances are it is about time to start encrypting the connection strings. Why is this important? If you have an external website that fails (and you do not have any custom error pages) then you may expose connection information in the stack trace or error messages. Also, you do not want to allow other developers that stumble upon your connection string to see your connection information in clear text. Over time and many applications later I went from trying to remember paths and commands and have created batch files to perform this on a minimal web.config. I am going to walk through how to create some encrypt/decrypt batch files and how these are used in conjunction with your web.config. Ensure you have a .Net Framework installed to use the aspnet_regiis.exe program. For this example we are using .Net Framework 4.0. You can now take the connectionStrings section and replace your cleartext version for your application. You should then see your original clear text connection string. Hope this helps. If you have comments inside of your connectionString the encryption and decryption will remove them.